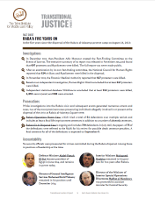 In December 2013, then-President Adly Mansour created the Fact-Finding Committee on the Events of June 30. The executive summary of its report was released in November 2014 and found that 607 protesters and 8 policemen were killed. The full report was never made public. After an examination by its own fact-finding committee, the National Council for Human Rights reported that 624 civilians and 8 policemen were killed in the dispersal. In November 2013, the Forensic Medical Authority reported that 627 protesters were killed. Based on an independent investigation, Human Rights Watch concluded that at least 817 protesters were killed. Independent statistical database Wikithawra concluded that at least 932 protesters were killed, 1,492 were injured, and 848 were arrested. Raba’a Operations Room Case, which tried a total of 51 defendants over multiple retrials and includes at least 3 final life imprisonment sentences in addition to a number of absentia. Raba’a Sit-In Dispersal Case is ongoing and includes 739 defendants. In July 2018, the papers of 75 of the defendants were referred to the Mufti for his review for possible death penalty sentences. A final sentence for all of the defendants is expected on September 8. Defense Minister Abdel-Fattah El Sisi became president of Egypt in June 2014, and remains in power today. Interior Minister Mohamed Ibrahim remained in his position for two years after Raba’a. Director of General Intelligence Services Mohamed Farid Tohamy remained in his position until December 2014. Director of the Minister of Interior Special Operations Directorate Medhat al-Menshawy was promoted to assistant minister for Central Security. Assistant Minister of Interior for Central Security Forces Ashraf Abdullah remained in his position for another year. Head of the Cairo Security Directorate Osama al-Sagheer was promoted to deputy interior minister for security. In July 2018, Sisi ratified a law which allows him to designate military officers of his choosing with lifelong reserve status. These officers will be protected from prosecution for events occurring between the suspension of the constitution in July 2013 and the seating of the House of Representatives in January 2016—a period of time which covers the Raba’a dispersal. Attacks on 64 churches on August 14, 2013, and an additional 19 in the following week were documented by independent monitoring project Eshhad. Since then, all of the destroyed churches have reportedly been reconstructed—the majority by the military and the remainder by the churches themselves. On August 18, 2013, 37 prisoners died inside a prison van, after officers kept the prisoners in the van for more than six hours, leaving some to die as a result of the heat and others as a result of tear gas shot into the vehicle. Four officers were prosecuted for the Abu Zaabal incident, but only one was issued a final prison term of five years. After the dispersal at Raba’a, Washington suspended deliveries of F-16 fighter jets, M1A1 tank kits, Harpoon missiles, and Apache helicopters. The deliveries were resumed in March 2015.